Tightness of a side neck muscle (sternocleidomastoid – SCM). 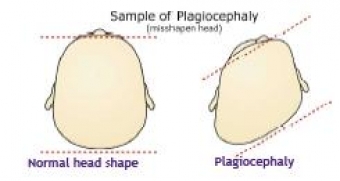 Plagiocephaly, (aka flat head syndrome) = flat spot on back or one side of infant’s head. When the infant’s head has found a resting side preference, the head will thus tip to one side. It could be acquired (positioning preference after birth) or the baby can be born with it. Possible Causes – Are there predisposing factors? It occurs when the sternocleidomastoid (SCM) muscle, on one side of the neck, is shorter or weaker than it should be. Position of the baby in the uterus. Infant staying in one head turned position for too long (torticollis). Infant lying on their back for too long (plagiocephaly). Could be congenital (born with) muscular torticollis. Affects the child’s ability of bending or turning the neck towards a shoulder. Head rotation may be hindered. Presence of a soft lump in neck muscle. Possible difficulty breastfeeding on one side. 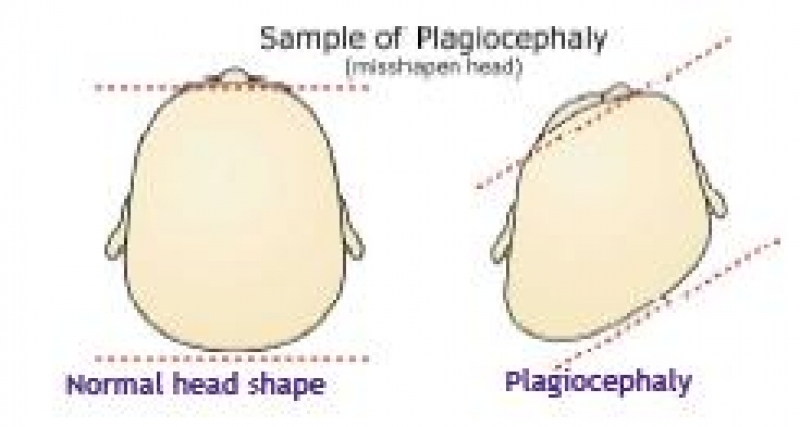 Infant may develop plagiocephaly (flattened side/area of baby’s head) from remaining in one position for extended periods of time. Usually diagnosed by post-partum physician. They will test the extent of the baby’s head mobility. If you notice your child unable to turn their head easily or have a flatter area of their heid, it may be a sign. Physiotherapy is often all that is needed to correct the tight muscle, and correct plagiocephaly. Education, exercises, stretches, play-time tips, tummy time, etc. CHEO has a program and resources available to help with self-management, as well as alternative treatment options when Physiotherapy is not enough. Check out CHEO’s information and home exercise sheets! Need more help? Not sure where to start? Give us a call and book an appointment with one of our experienced physiotherapists.